Archaeologists digging at Khirbat en-Nahas (in Jordan) believe they have uncovered King Solomon's copper mines, reports the LA Times (Via Discover Magazine). Recent research places the mines "firmly in the traditional timeline of King Solomon." 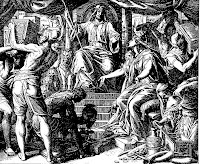 But was there really a King Solomon as described in the bible? Skeptics scoff, "taking the biblical description of King Solomon literally means ignoring two centuries of biblical research." Hi, [url=http://www.topamaxdirectonline.com/]where to buy topamax [/url] - topamax pills - topamax for migraines http://www.topamaxdirectonline.com/. 2, [url=http://www.ativangenericonline.com/]buy lorazepam no prescription [/url] - lorazepam no prescription - buy lorazepam online no prescription http://www.ativangenericonline.com/. 5, cheap strattera online - strattera online no prescription - strattera no prescription http://www.stratterarxcoupon.net/. 12, [url=http://www.adipex37-5rx.com/]order adipex [/url] - adipex online without prescription - cheap adipex diet pills http://www.adipex37-5rx.com/.